A red alert has been sounded against the ISI’s game plan to disturb peace and sanctity during the Durga puja festival in the city and other parts of Bengal. The Kolkata police chief, Mr Sujoy Chakraborty, said they had reports that some terrorists and other communal forces may enter Kolkata from Bangladesh, Bhutan and Nepal to disturb peace during the puja. 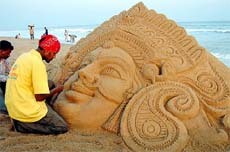 Sudarshan Patnaik, a sand artist, creates a sculpture of the Hindu goddess Durga in Puri, Orissa, on Sunday. The annual Durga Puja festival, which starts on October 12, is one of the most popular festivals for Hindus. The Congress, is heading for a confrontation with the Mayawati-led government in Uttar Pradesh over the allotment of land for Indira Gandhi Pratishthan. Acting on a letter of Lok Sabha member Simranjit Singh Mann, External Affairs Minister Yashwant Sinha has recently instructed the officer concerned to examine the matter relating to issue of stay letters by the Indian Embassy in Italy to Indian citizens to enable them to acquire residential permits from the Italian Government. A day before he leaves for a week-long visit to Europe, Prime Minister Atal Behari Vajpayee today hosted lunch for President A.P.J. Abdul Kalam, Vice-President Bhairon Singh Shekhawat and others at his residence here. The concept of e-governance is fast emerging across the globe. But, despite India being one of the information technology giants in the world it has failed, so far, to avail the technological advancements in an extensive manner for governance and public administration. Tamil film superstar Rajnikanth, who sparked off a controversy over his remarks on the Cauvery water issue, today visited the capital amid speculation that he was planning to meet the Prime Minister seeking an early resolution of the issue between Karnataka and Tamil Nadu. Activists of the RSS and Anandmargis clashed over the playing of loudspeakers at their functions here yesterday, resulting in injuries to 15 persons from both sides, the police said today. The 33rd International Film Festival of India continues to chug along more innocuously than colourfully with the accent on mediocrity, especially the Cinema of the World section. A heinous murder reported in Hindol district of Orissa, where a seven-year-old boy is beheaded by a village youth. Hindu and Muslim students in a girls' school in Uttaranchal learn each other's scriptures. A red alert has been sounded against the ISI’s game plan to disturb peace and sanctity during the Durga puja festival in the city and other parts of Bengal. The Kolkata police chief, Mr Sujoy Chakraborty, said they had reports that some terrorists and other communal forces may enter Kolkata from Bangladesh, Bhutan and Nepal to disturb peace during the puja. Accordingly, different community puja committees had been warned. It had also been decided to deploy cops in plain clothes at all important puja pandals. Special armed police pickets would also be posted at all vulnerable places, said the police chief. The police, during the past few days, had conducted raids at several criminal hideouts in Kolkata and the district and seized a large quantity of firearms, including unlicenced guns, grenades, RDX and other explosive materials. Over 160 persons including six KLO leaders, had been arrested during these raids. Yesterday itself, five grenades and three rifles and some explosives were recovered from a long-distance bus leaving from Howrah station for Midnapore. The police said these firearms were being transported to the Naxalites and MCC who are now active in the Keshpur-Debra-Gopivallabpur areas. The DGP, Mr D. Bajpayee, said the police and the BSF in all districts, adjoining Bangladesh, Nepal and Bhutan had been alerted against illegal entry into the state. He said KLO and ULFA activists had joined hands in north Bengal who might strike in the Darjeeling-Jalpaiguri-Cooch Behar areas during the festival season. Unlike previous years, this time workers and volunteers of the CPM and other Left parties will be at different puja pandals in the city and elsewhere to help the police and the puja committees for maintaining peace and harmony during the festivals. The CPM will also try to develop larger mass-contact through the puja pandals. In Kolkata, this year, the total number of community puja will be around 1,800, of which some 760, have been listed as special category which will be inaugurated by the VVIPs like the Governor, the central and the state ministers, film stars, novelists, singers and other important personalities. Bollywood stars like Shahrukh Khan, Manisha Koirala, Taboo, Amitabh Bachchan and Jaya Bachchan and the union ministers like Shatrughan Sinha and Vinod Khanna, and BJP President, Mr Venkaiah Naidu have been invited by different puja committees to inaugurate the puja. The Congress, is heading for a confrontation with the Mayawati-led government in Uttar Pradesh over the allotment of land for Indira Gandhi Pratishthan (IGP). Notwithstanding assurance from the Chief Minister that her government would allot land for the IGP in the Gomti Nagar area, the Congress is asking for same land which had been acquired by the government for constructing Dr Ambedkar memorial research centre. We will not compromise. We want that piece of land which was originally allocated for the IGP, said the chief spokesman of the Uttar Pradesh Congress Committee, Mr Akhilesh Singh. The IGP issue had already infused a new life into the moribund Congress. By organising a rally in the state’s capital last week Congress leaders have proved that the name of Indira Gandhi can still be the binding force. Congress leaders in hoards had descended on the state’s capital to take part in the rally. Two days after the rally Congress leaders held a dharna near GPO Park — at the heart of the city — again on this issue. In its attempt to buy peace the state government had offered 25 acre of land for the IGP at new location. The Congress, it seems, has refused to bite the bait. The chief spokesman of the UPCC told The Tribune that it was wrong on the part of a government to acquire land or change the name of any on-going project. “Today Mayawati is in power. Tomorrow other party will come to power. What will happen if that party changes name of Ambedkar park,” he asked. The 25 acres of land, in the posh Gomtinagar locality of the state’s capital, was earmarked for constructing the research centre where a hostel for 2,500 students, an auditorium and a research institute was planned. On October 2, 1989 a foundation stone was laid by the then Chief Minister, Mr N.D. Tiwari. The state government even sanctioned Rs 8 crore for construction of the centre. Around Rs 6 crore was spent on the construction of a boundary wall and about Rs 90 lakh is still pending in the account of the pratishthan. With the change of power in 1989 the proposal was thrown in the lumber room and since then it is lying in the state of neglect. Mr Mann in a letter to Mr Sinha had pointed out that around 3,000 immigrants were anxiously awaiting in various parts of Italy, attempting to obtain stay letters from the Indian Embassy there so that they approach the Italian Government to get stay permits. Deputy Prime Minister L.K. Advani, Finance Minister Jaswant Singh, External Affairs Minister Yashwant Sinha, Parliamentary Affairs Minister Pramod Mahajan, Rajya Sabha Deputy Chairperson Najma Heptullah also attended the lunch. 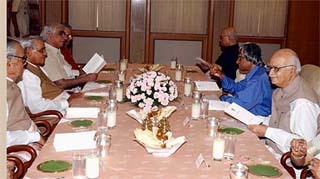 This is the first time President Kalam has attended a lunch at the Prime Minister’s residence. Former Presidents K.R. 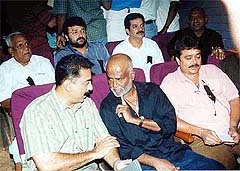 Narayanan and R. Venkataraman were also invited. However, Mr K.R. 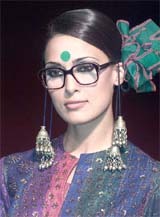 Narayanan could not make due to prior engagements, source said. The Prime Minister is leaving tomorrow on a week-long tour of Cyprus, Denmark and Britain. The concept of e-governance is fast emerging across the globe. But, despite India being one of the information technology (IT) giants in the world it has failed, so far, to avail the technological advancements in an extensive manner for governance and public administration. There has also been innumerable debates and discussions in the recent past on extensive use of computer and telecom technology in government departments to get rid of the age-old system of maintaining records and move towards the ultimate goal of making government offices “paperless” (or rather less paper). While some technology saavy states like Andhra Pradesh, Tamil Nadu and Karnataka have made some forays into e-governance and have started adopting technology for streamlining government records, especially land records, etc, majority of the states in the country have failed to even take one big step forward. In many government departments, despite computerisation have failed to make optimum utilisation of equipment either due to the lack of expertise or due to the lack of mind-set among the workforce for reforms in work culture. Under this background, Department of Administrative Reforms and Public Grievances, Ministry of Personnel, Public Grievances and Pensions will be holding its sixth national conference on e-governance in Chandigarh on October 24 and 25 in collaboration with the Department of Information Technology, the Government of Punjab and the NASSCOM. According to official sources, the conference session would focus on issues such as business processes and six-sigma approach in the government, transforming attitude and mind-set for Reforms, interfacing local language solutions for web enabled applications, development and deployment of security solutions and digital signatures in government departments, institutionalising and implementation of India online modalities and mechanism and such other emerging concepts/practices in e-governance. About 1,000 delegates, including several experts in the field from across the country and abroad are likely to participate in the conference. Mr R. Krishnamoorthy, an international expert on public systems towards e-governance, who will be presenting a theme paper during the conference emphasises that for e-governance to become a reality in India a lot depends on the political will to downsize the “babudom” and assess and avail the technological advancements. Pointing towards constitutional hurdles in the way of adopting technologies, Mr Krishnamoorthy said to reduce storage of records, micro-filming was adopted in the UK and the West, whereas the Evidence Act does not allow micro film as an evidence in Indian law courts. The film star remained tightlipped over the issue and refused to make any comments apart from saying that he had already clarified on the matter in Chennai on Saturday. He refused to confirm that he was planning to meet the Prime Minister but only said he was on his way to Rishikesh. No confirmation was available from the Prime Minister’s Office (PMO) on whether Rajnikanth had met the Prime Minister. The trouble started when around 1,000 persons belonging to the two organisations were holding their meetings on the first two floors of Maharana Pratap Bhavan, Patna SP O.N. Bhaskar said. The Australian film “Mallboy” by Vincent Glarruso is quite pathetic. It captures the trauma of 14-year-old Shaun due to his broken family background. His father has left his mother and is living with a younger woman. His sister is pregnant. He is on drugs. It is a weird world. The most famous four-letter word is copiously spat out with all its adjective and participle forms. Everything is fun and games for this poor broken family. Stealing from the supermarket is not unusual. May be a cat-fight between the mother and her younger rival is a highlight of sorts but one fracas follows another with amazing regularity. For dramatic relief the mother lights her cigarette on a burnt out chicken in the oven. Shaun is distraught, torn between the two parents. That he ends up in a sort of correctional home is not the most convincing climax. The film is one long bore, except of course if you have a particular fondness for that four-letter word. The Polish film “The Debt” by Krzystof Krause is about an extortionist who manages to terrorise two youths and gets them deep into the mire, till they decide to take the law in their own hands. Director Krause manages to sustain the suspense but at the end of the day one is sure to suspect the credibility of the whole story. The Danish film “Dancer in the Dark” by Lars von Trier is much better as it deals with the plight of a Czech immigrant single mother Selma who works in rural America. She has a son who like her is getting blind. For a while she endears herself to the locals but when she is suspected of murder she is the target of much antagonism. It is about immigrants in America and how they are looked down upon, yes racist. Meanwhile the Hollywood musical is the inspiration for much of the song and dance involving this dancer. The film meanders a bit but the ending is very dramatic and makes up for much of the slow pace in between. Five thousand young men from the Jai community perform prayers for world peace at Sahibaug in Ahmedabad on Sunday. 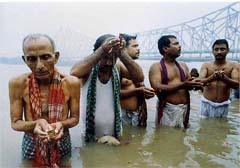 People offer tarpan (water to their forefathers) on the occasion of the Mahalaya, on the banks of Ganga river, in Kolkata on Sunday. The famous Howrah bridge is seen in the background.